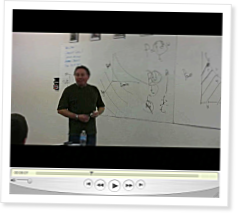 In this two part lecture, Coach Greg Glassman unifies fitness and health. This lecture is the first time we’ve published a revolutionary new component (a three-dimensional model) that has the potential to both redefine and unite the health and fitness fields forever. Health can now be concisely and precisely defined as increased work capacity across broad time, modal, and age domains. Work capacity is the ability to perform real physical work as measured by force x distance / time (which is average power). Fitness is this ability in as many domains as possible. Science is about measurement and prediction. Without measurable, observable, repeatable data concerning the fundamental physical units of kinematics (mass, distance, and time or MKS) there is no science of human performance. This is true of the planets, automobiles, and exercise. Physical output can be measured in terms of foot-pounds/min. We move our own bodies and we move external objects. We can measure how heavy those bodies and objects are, how far they travel, and in what time period. Your ability to move large loads, long distances, quickly, in the broadest variety of domains is fitness. And the ability to sustain that fitness throughout your life is a defining measure of health. CrossFit’s prescription for achieving this fitness is constantly varied high intensity functional movements. We can accurately predict improvements in work capacity across broad time, modal, and age domains through this prescription. We have tens of thousands of examples at this point. The new component introduced in this lecture is age. Fitness can be graphed in two-dimensions with duration of effort on the x-axis and power on the y-axis. At each duration, we average your power capacity across a variety of modal domains (skills and drills). This creates a power curve, the area under which is your work capacity across broad time and modal domains (aka fitness). We can now add a third dimension to this graph, the z-axis, which is age. By reassessing your two-dimensional fitness at various times throughout your life, we graph the form of a solid. The power curve takes on the shape of a plateau or blanket. This three-dimensional graph is a defining measure of health. Health, therefore, is nothing other than sustained fitness. In Part 1, Coach covers the first three operational models of fitness originally published in the seminal What is Fitness article, and how they become united by the work capacity graph. 20min 0sec. In Part 2, Coach explains the fourth model, the sickness, wellness, fitness continuum, and how that becomes subordinate to the metric of maximizing the volume of work capacity across broad time and modal domains throughout your life. 17min 51sec. I understand but only partially. What else can I read to understand more the terms of force, distance, time, power, and also their relation to exercise? I grasp that this allows for a mete and now one over age. My problem is with the terms themselves and I don't understand what they are abstractions for if they are abstractions or concrete names for a thing of which I don't understand, that thing in nature. I apologize if this isn't the place for this and it's a mathematics classroom. Manuel, this is a very helpful website I used throughout my physics courses. Newtons Laws Within Newtons Laws you will find definitions and examples of the terms you look for. As a physics major and now CF Affiliate when I first saw fitness defined as the area under the work capacity curve it was obvious you all were on to something. When you added a third axis and begin calculating volume as you did at the affiliate gathering I realized that within a decade these graphs will be in every physiology book published. That will finally be a new edition worth purchasing! Keep up the GROUND BREAKING WORK! Mechanics actually might be more appropiate, my apologies. This was pretty cool. Mike Ray gave us pretty close to the same speech at the Level 1 in Okinawa last weekend. I'm glad to see things are straight across the board. Incredible. As a physicist this makes so much sense to me, and it just seems so simple. it makes me wonder why no one has come up with the definition before! (Not to take anything away from Crossfit of course!) Coach is a really great speaker as well, very good to watch. I saw this concept presented at Filfest for the first time and just counted myself lucky to be at the forefront of defining fitness and to be able to learn from Coach. so many people unaware of him and his revolutionary approach to fitness. How sad. Great stuff. He makes some generalizations about other fields of study that I'm sure people in those fields would object to, but overall Coach Glassman's ability to take these fitness concepts and turn them into something USEFUL, something QUANTIFIABLE, is a huge step forward. I relate especially because I'm an engineer; I'm not a pure scientist. I don't just want to understand an effect or parameter, I want to know "What can be built or improved because we have that measurement?" Coach has done this for fitness in a startling way. I also like these videos because the addition of age as an axis addresses the issue of long term consequences for short term gains. The 2-D model, taken in it's strictest sense, makes any long term consequences (injuries, joint or tendon overuse, long term negative consequences of chemical enhancement)irrelevant as long as your work capacity NOW is improved. With the 3-D model there is an additional consideration of increasing work capacity but also a necessity to avoid methods so extreme that long term work capacity will be impaired. Tony Budding did this same speech at our Level 1 Cert. in Malvern, PA last weekend. The beauty of this model is that it doesn't stack the parameters in favor of CrossFit. We could all be heading down the road of crashing and burning as we get into our elder years; we simply don't know. While I highly doubt that from the anecdotal evidence I have seen with my own two eyes at the gym witnessing 60+ year old women kicking up into handstands for the first times in their lives, we WILL know for sure as the data points come in. CrossFit is just as accountable to this objective standard of measure as the other models of achieving "fitness" are. It's the stuff of genius that usually requires a little sweat leaf to coax out of our minds (not that I would know from experience). "Dude, what if I we added AGE to our definition of fitness... wait, hold that thought for a sec... where'd you put that box of Cheez-Its?" This is quite an interesting synthesis. Very few people in the exercise science arena have spent this much time actually trying to unify the concepts surrounding fitness into a nice package. I know we will be discussing this in the future but I have a question ... instead of health, would the solid area under the 3D curve represent quality of life since it represents function over the lifespan? I hate the current usages of the terms "health" and "wellness" in the popular media, government agencies, and the health care arenas. They are generally obtuse definitions or lack any real measurability. This lecture is definitely leading us in the correct direction. Can't get enough of this...been in and around fitness for over 25 years and nothing has made more sense...Merle it is only a matter of time til the viral nature of information will make this available to anyone who cares...Coach rocks! What is the 4th metabolic pathway and where is it mentioned? Also, is there a way for the CrossFit model to account for strength? By this I mean that the work capacity vs. time graph would be inappropriate when measuring a strength workout. A recent study suggests that the 4th metabolic pathway involves using what was heretofore the evil "lactate" as fuel. And you seem to have missed the boat - of course the CF model accounts for strength. But if you mean how does someone with a 400lb squat fit onto that graph, the answer is that in order to measure "fitness", it's not enough just to be "strong". You need to be able to use strength productively. But even a 1RM will fit on the graph because it takes some amount of ?time" to do a 1RM bench or squat. We could graph those at 5 secs of effort, for example, as opposed to Cindy or Helen. Love the observable, measurable, and repeatable applicability of mechanical engineering/physics to CF. Where I am getting a bit wrapped around the axle is the graphing of power vs time. Wouldn't it be work vs time for it to be a power curve or else if you graph power vs time you are graphing work/time vs time again? Sorry it's been awhile since I fully remembered all my engineering and physics courses. Additionally, when calculating work or power wouldn't one need to determine the Fnet not the W of the bar since Fnet is the upward force necessary to break the mass free from the gravitational pull at a specific acceleration or is it null since there is an upward acceleration from the ground and a deceleration near the top? Again I may be overcomplicating things but I was pondering this when Tony was describing this in the level 1 lecture and I didn't want to bog the class down. This was damn interesting stuff! This absolutely phenomenal stuff, and a real paradigm shift, which I've been following before and after these videos were posted. Kudos to the entire team and especially to Coach Glassman. However, I have some confusion about this model of Fitness as the (integrated) chart of power vs time. "Power", as Glassman describes it himself, already has the time element. Indeed, the improvements in one's performance are always accomplishing the work in less time (i.e. "more efficiently"). He says all of this, and I'm riveted, because it is so simple yet so profound. *However*, he then proceeds to plot a chart where "duration of effort" is used as a part of the definition of an activity. So, when we plot an activity (viz., "Fran", or "5K", or "max deadlift"...), we plot it based on the "duration of effort"... even though the whole metric of "power" (the other axis) is based on decreasing that duration. I guess what I'm asking is: How can we define the activities as predicated on "duration of effort" if that is the very factor we have to change in order to increase on the other axis (power)? I mean, I see how it could work to show my improvement in a single activity (e.g. Fran time got smaller, therefore power output is higher), but not in more than one activity on the same chart, since there are no delineations between what is a "good Fran" vs a "good 5K" (certainly they are not the same thing). I listened to the lecture again, and understood better. He is taking an average of performances for the particular events. Your curve of "fitness" is how you measure up compared to the average performance at every length of duration. Has crossfit published the 3 dimensional curve with averaged crossfit population numbers? Perhaps from the gains. I'm interested in the predictive value of such a curve in my own aging. Because the "masters" population tends to be lower in most boxes, I'd like to be able to more effectively compare my performance against the younger cohort in the box. It would be great to have this curve quantified for that purpose. Why is crossfit the new fitness trend? Just because it works.